The key to comparing and choosing between particular toilets is matching the models with your needs and preferences. There are a number of factors to consider, such as different colors, heights, flushing capabilities, price tags — which can top $6,000 — and the technology that goes into it. Today’s toilets come in two types- either a smaller, round-front bowl or a longer, elongated-front bowl. The round-front bowl is ideal for compact bathroom spaces and is found extensively in older homes. Elongated bowls with a longer rim dimension are more comfortable for adult use and improved hygiene. Plumbing codes require elongated bowls in commercial applications. Also, if your current toilet has a 12-inch rough in, you will need to focus on toilets with the same rough in requirements, unless you are willing to exert the effort and expenses to change the toilet rough in of your bathroom. All-in-all, understanding your current toilet and knowing the pros and cons is the best place to start. Flush rate is the amount of water in gallons used in a single flush. When purchasing a toilet you can choose from water saving, standard, and dual flush models. Bowl shape is the shape of the toilet bowl when looking down from above. Choose from round front, elongated models, and compact elongated models. 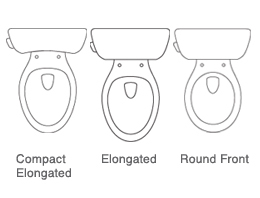 American Standard redefines the architecture of toilets with unique shapes and profiles supported by best-in-class clog-free performance. Like a finely-tuned luxury car, the furniture-inspired LXP Toilets from American Standard are high-efficiency, low-consumption (1.28 gpf/4.8 LPF) and feature the best engineered flushing systems available to prevent clogs and overflows. Jetted action under the rim of the toilet powerfully scours the sides of the bowl to remove every last trace of paper and waste. These toilets have been independently rated* to flush as much as 1,000 grams of solid waste and come standard with our EverClean® surface, making them easy to keep clean. 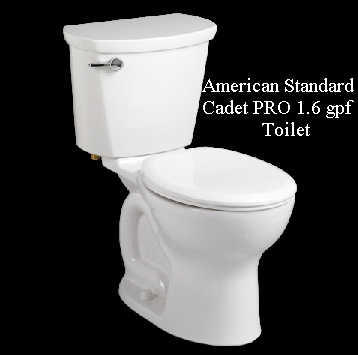 Part of the coordinated Cadet® Suite, the low-consumption 1.28 GPF Cadet PRO™ toilets from our trade-only Cadet PRO line offer professionals great value, price and performance. These toilets feature the Cadet Flushing System for higher performance and fewer clogs, PowerWash® rim to ensure a powerful flush and superior bowl cleaning, and EverClean® surface to stay cleaner, longer. The Cadet PRO achieves the highest MaP bulk removal rating of 1,000 grams and comes backed by a 5 year warranty. Cadet PRO toilets are available in a variety of models including elongated, compact elongated or round front shapes, 16-½” Right Height® or standard rim heights, all with a water efficient 1.6 GPF flush. Modeled after the Champion®, but with a slightly smaller flush valve and 5-Year Limited Warranty, the Cadet PRO series of toilets was designed to drive water more rapidly through the bowl for greater flushing power, minimizing clogs, noisy flushes and overflows. These toilets have the permanent EverClean® surface that inhibits the growth of stain and odor causing bacteria, mold and mildew on the surface. This helps keep fixtures cleaner longer. The PowerWash® Rim scrubs the bowl with each flush, eliminating the need for a scrub brush. ** MaP testing performed by IAPMO R&T Lab. MaP report conducted by Veritec Consulting Inc. and Koeller and Company. The basic toilet for Kohler is the Wellworth. This toilet comes as a standard height toilet with a round front seat or a taller toilet with an elongated front toilet seat. The Kohler Wellworth comes complete in a kit with a high quality plastic seat and wax ring. The trapway size on the Wellworth is 2-1/8″ which is larger than standard. Kohler makes toilets that flush very well and even though this is not even close to their best flushing toilets, it is great for the price. The fill valve is a Fluidmaster quality fill valve. The tank is bolted to the bowl with a three bolt system for added support. The Wellworth toilet has a canister system flush valve allowing for a quick 360 degrees of water which is almost the same system as the new Cimmaron, but it’s not quite as good because it is the older technology and not quite as refined. Overall this is a good quality toilet inside and out. Class Five® flushing technology offers plug- and leak-free performance, extraordinary flushing, and better rinsing power for a cleaner bowl. Toto is the world’s leading manufacturer of plumbing fixtures and products. The company produces toilets, urinals, lavatories, faucets and valves designed to provide quality performance and optimal energy and water conservation. The Toto models match various decors and settings and are available with one of four flushing system options. These toilets are designed to provide optimum water savings through exemplary one-flush execution. The toilet bowl uses two nozzles that shoot water underneath the bowl’s rim and then propel the water into the exit pipe for a more intense flush. An extra-wide flush valve combined with an oversized siphon jet enables this toilet to flush clean while providing substantial water savings and quiet processing. The large flush valve, glazed trapway and oversize siphon jet on this style provide quiet, forceful flushes that resist clogging and resurgence of flushed materials. This double-flush model has an adjustable water usage system to meet specific customer needs and preferences. Naturally, you want to go with a product that is going to work great, last long and save you more money in the long run. Whether a toilet can do its job is an important factor. Ace Hi Plumbing recommends American Standard before any other because of the great quality overall which includes the gravity-assist technology, low-consumption 1.28 GPF, great price and performance, and even offers a 5-year warranty. American Standard provides excellent customer service and makes it easy to get parts when your toilet is in need of repair. The Kohlers are nice, however, they do not flush as well as the American Standard toilets. They have a more conventional flapper and metal handle, and the American Standard have more of a tower design. These toilets are also not as economical as the American Standard toilets and parts can cost you more. Although the Toto toilets have more modern designs then the American Standard and Kohler toilets, they do not provide the best flush possible. Toto provides great quality toilets but you should also always consider the possibility of having to buy replacement parts in the future. Check prices and availability. A good place to start is by doing your own research to find exactly what you are looking for. Consumersearch.com is a great site and evaluates thousands of owner comments and more than a dozen professional reviews and ratings to find the best standard toilet, water-saving toilet, and designer toilet and bidet. One of these is sure to fit your bathroom and lifestyle. To get more information or to schedule a new toilet installation call ACE HI PLUMBING, HEATING & AIR today at 970-667-0300 to schedule an appointment. We are located in Loveland, Colorado and service the Northern Colorado areas including Fort Collins, Berthoud, Longmont, Milliken, Johnstown, Greeley, Evans, Drake, and Estes Park.